You might have read already that the ZISPA website is down. ZISPA is the custodian of Zimbabwe’s .co.zw domains and until recently when registrars started to offer it, their website was the only platform you could check a .co.zw domain’s availability on. Now, registrars such as Webdev, Webnames, and Name now offer domain availability checking. The ZISPA website going down though has caused some unexpected problems with registrars and we have to warn you to remember not to believe everything you read on the internet, especially when you check for a domain’s availability on some of the registrar’s websites. A few days ago, checking any domain whatsoever on the Webdev and Webnames sites, you’d get the “That domain is available” sweet news. Any domain, including those not available that is. Webdev itself would tell you that webdev.co.zw is available. Confusing isn’t. When we published the ZISPA story, and ZISPA fiddled with their server a bit, the problem changed to the opposite extreme. Now any domain check returns “Sorry, domain is already taken”. Any domain, including those obviously not taken. 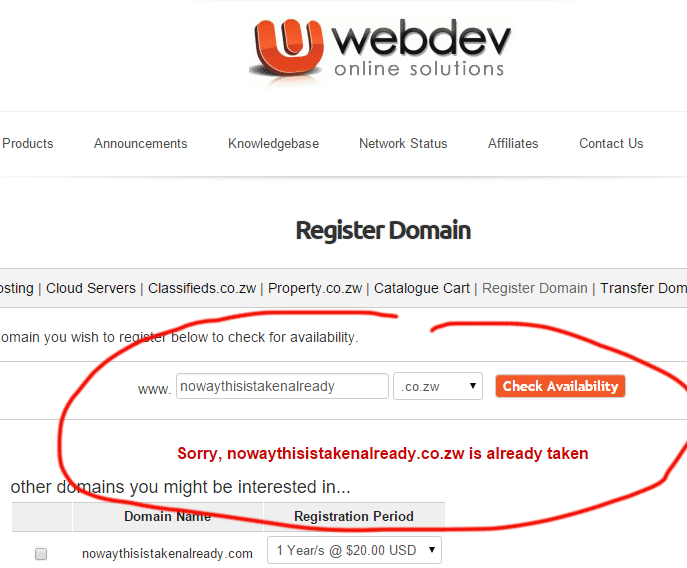 Check for nowaythisistakenalready.co.zw for example and it’s already taken. That’s the bad news. The good news is that some domain registrars are not part of the confusion. Name.co.zw whom we have written about a few times here, is returning the correct results. And so is GetDomains.co.zw, another new entrant we wrote about this week. Keep this mind next time you think a domain is already taken, or is not! I am glad we are your provider of choice. Thanks a lot for the support and encouraging feedback. We are always there for your support, Rushmore sometimes responds to emails as well kkkkk! Am happy to hear this positive feedback, i am humbled. Glad you made us your service provider of choice. We will strive to give you the best. Am sorry you went through that. uhhm no. webdev’s domain checker does work! 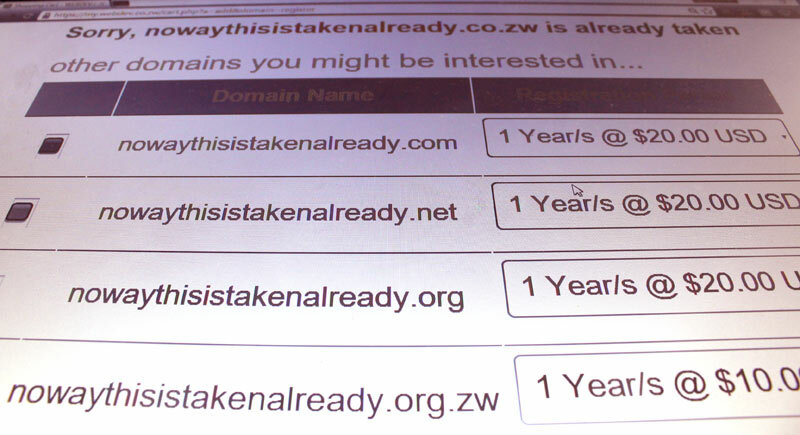 by that you mean that nowaythisistakenalready.co.zw is actually a registered domain? thanks for pointing that out, this does seems like a general issue with whmcs since zispa had their issues. however, is the sarcasm really necessary??? I tried getdomains.co.zw today and was very impressed. Domain availability checker it’s reliable easy to use, at least it’s not part of the other registrars mention here with invalid domain availability checker. Yes name.co zw is now not working, tried it. this is getting worse than I thought. only getdomains.co.zw is working. @ACy and @Mashy I work for name.co.zw. I have just fixed the error. I’m sorry for any inconvenience it may have caused you. It’s totally my fault. Last night our database cluster ran out of space and I only became aware of this a few minutes ago, thanks to the Good Samaritan who email us. We use the database to verify whether or not domain being searched has not been paid for. The new name.co.zw is using a completely different infrastructure from the old one including the database cluster. Unfortunately, I haven’t yet finished setting up automated monitoring for all the components involved. I also like to take this opportunity to point out that name.co.zw never gives you incorrect results. If it runs into any error while checking, it tells you so like in this case. It never lies.